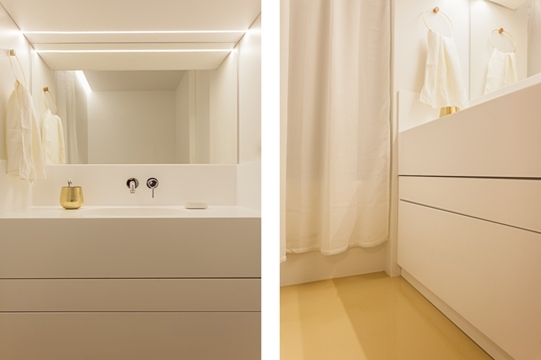 The process of cooperation: The client contacted us from his then home abroad with an aim to built new home in Prague. 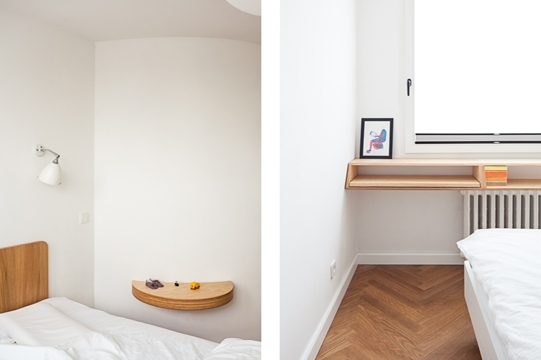 We only met three times by person during the design and building process, for the first time in the apartment and then when choosing the particular materials. Otherwise all was arranged through videocalls and emails. 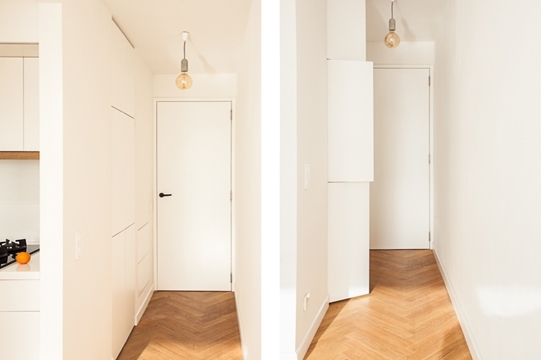 In between February and June it was managed to not only design the apartment, but also to contract the supplier and refurbish the whole apartment so it would be possible for the client to move in during summer, which happened, to the content off all participants. The whole process was by a large part influenced by the enlightened investor, who had an unflagging interest to get the proposed idea in its all extent, which is not commonplace in our setting. The client enjoyed the at first sight formal arrangement and was able to perceive its sophistication. 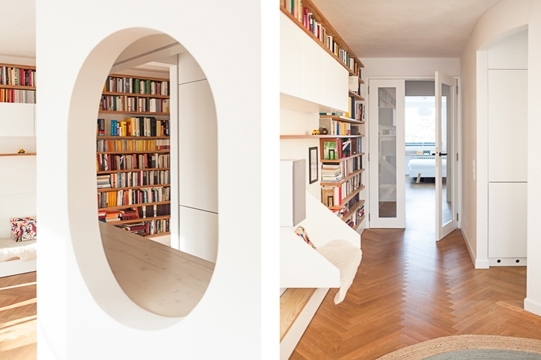 The oval and the space around it that contains another places and nooks with defined functions, vistas and shapes. Situation: A young four-member family requires sufficient amount of storage, separated kitchen, large bookcase, small homeoffice and two toilets while keeping the apartment passable. 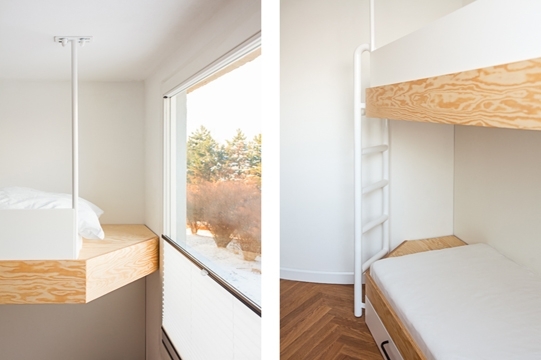 Concept: Considering the limited space and options of a prefab apartment house, we used the existing central position of the shaft for an easy attachment of the new piping. In the immediate proximity of the bathrooms there is a walk-in closet and all the facilities are therefore wrapped in an oval in the middle of the apartment. We find ourselves either inside or outside, noticing either convex or concave curves which give the living space a cosy softness. 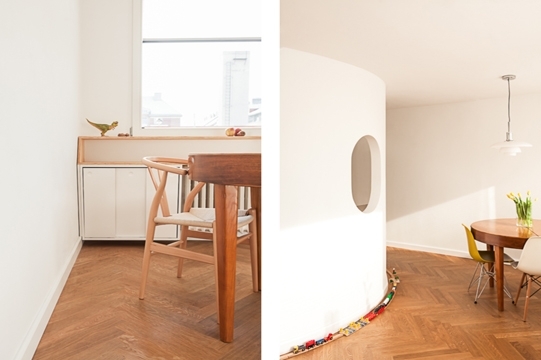 Variations of the circular motives can be found throughout the apartment. 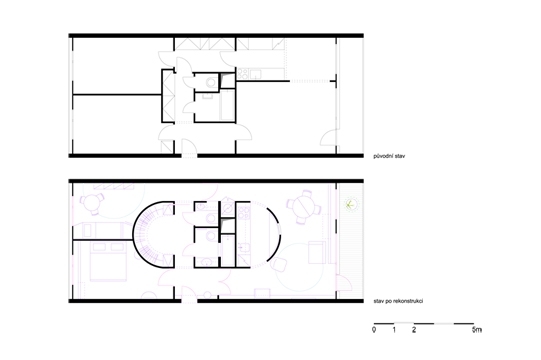 The important element of the concept are the vistas through the whole apartment, the cross one through the facilities as well as the two longitudal ones, which offer to perceive both ends of the apartment and the motion of inhabitants and light throughout the whole space. Thanks to the arrangement the light gets into places which it could never access before, for example the corridor between the children's room and the living room. This connection, which also accommodates the washing machine, dryer and laundry basket, both accessible from the corridor and the bathroom, was very appreciated by the clients. Kids, laundry and proximity of the kitchen, which is also nearby the entrance, is perceived as very convenient. 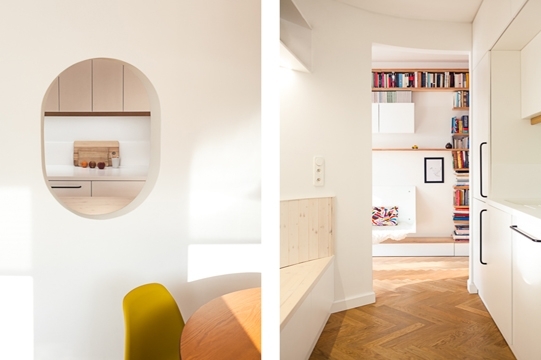 The individual spaces are therefore clearly defined as well as naturally connected, by which the apartment gains airiness in both living spaces and its facilities and permeability, which was the integral part of the task. Permeability was logically one of the principal ideas of the project and it's a pleasure to see how it all works. The connection of function and concept is in fact the natural aim of our work. 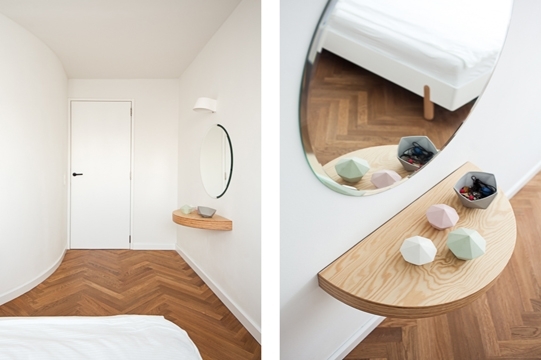 Materials: New oak parquet blocks and PUR screeds on bathroom floors, white lacquered and pine plywood built-in furniture, black details, corian sinks and kitchen desk, combination of new and old furniture and lights, drywall curves.